Receipt for Harry Seidelman on his stocks purchase. Receipt issued March 12, 1971. Receipt for Harry Seidelman on his Salmon Gold stocks purchase. Receipt issued November 23, 1949. Receipt for Harry Seidelman on his Morris Summit stocks purchase. Receipt issued December 15, 1949. Letter with two enclosures (another letter and a form) from Meredith, Marshall, McConnell & Scott, barristers and solicitors, to Harry and Esther Seidelman regarding their house mortgage. Letter is dated August 11, 1970. Letter from Meredith, Marshall, McConnell & Scott, barristers and solicitors, to Harry and Esther Seidelman regarding their house mortgage. Letter is dated August 11, 1970. 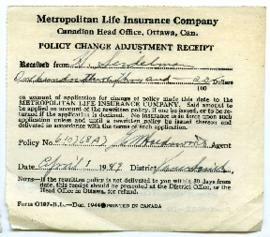 File contains 5 Royal Bank of Canada Savings Department log books collectively spanning from 1926 to 1930.